1 Facultad de Ciencias Biológicas, Pontificia Universidad Católica de Chile Av. Bernardo O'Higgins 340, Santiago, Chile. 2 CNRS, Sorbonne Universités UPMC Université de Paris VI, Pontificia Universidad Católica de Chile Universidad Austral de Chile, UMI 3614 Evolutionary Biology and Ecology of Algae. 3 Instituto Milenio de Oceanografía, Chile. 4 Departamento de Oceanografía, Universidad de Concepción Barrio Universitario, P.O. Box 160-C, Concepción. ABSTRACT. The Exclusive Economic Zone of Chile defined by Easter Island and Salas y Gómez Island is in the South Pacific Sub-tropical Gyre (SPSG), putting it at the center of the most oligotrophic and biomass poor waters in the world. Only 10 biological oceanographic expeditions have entered this zone in 105 years (19052010). We review key aspects of the plankton ecosystem and biogeochemical function relevant for the understanding of and conservation planning for marine environments. Plankton production is limited by lack of dissolved inorganic fixed nitrogen, not phosphorous. Higher organic nitrogen levels might be biologically unavailable. Short-term experiments suggested iron is not limiting, yet iron still likely limits nitrogen fixation, and thus production, at longer time scales, as the presence of nitrogen-fixers is exceptionally low compared to other ocean gyres. Plankton function is dominated by the smallest unicellular organisms, picoplankton (<3 μm in diameter). The SPSG represents a center of high biodiversity for picoplankton, as well as heterotrophic organisms such as tinntinids, siphonophores, and possibly amphipods, although data for key zooplankton, such as copepods, are lacking. Many groups exhibit negative relationships between diversity and total plankton biomass. High diversity might result from dispersal from a very large metacommunity and minimal competition within functional groups. Whether an island-mass effect causes a real or apparent increase in plankton biomass around Easter Island must be confirmed by high-resolution sampling in situ. Long-term threats to the planktonic ecosystem may include climate change-enhanced ocean stratification and plastic marine debris accumulation. Finally, priorities for future research are highlighted. Keywords: Easter Island, Salas y Gómez Island, oceanography, plankton community, biogeochemical function, pelagic ecosystem. RESUMEN. La Zona Económica Exclusiva definida para Isla de Pascua e Isla Salas y Gómez está en el Giro Subtropical del Pacífico Sur (GSPS), en el centro de las aguas más oligotróficas y con menor biomasa del mundo. Sólo 10 expediciones oceanográfico-biológicas han entrado en esta zona en 105 años (1905-2010). Revisamos los aspectos clave del ecosistema planctónico y la función biogeoquímica relevante para su comprensión y planificación de su conservación en ambientes marinos. La producción de plancton está limitada por el nitrógeno inorgánico disuelto y no por el fósforo. Los niveles más altos de nitrógeno orgánico pueden no estar biodisponibles. Experimentos sugirieron que el hierro no es limitante, sin embargo, probablemente limita la fijación de nitrógeno y así la producción a escalas de tiempo mayores, ya que los fijadores de nitrógeno son excepcionalmente escasos en comparación con otros giros oceánicos. El plancton está dominado por picoplancton (<3 μm de diámetro). El GSPS representa un centro de alta biodiversidad para el picoplancton, así como para heterótrofos como tintínidos, sifonóforos y posiblemente anfípodos, aunque faltan datos de zooplancton clave (copépodos). Muchos grupos muestran relaciones negativas entre diversidad y biomasa total. La alta diversidad puede deberse a la dispersión de una gran metacomunidad y una mínima competencia entre los grupos funcionales. Si el efecto masa de isla provoca un aumento en la biomasa planctónica alrededor de Isla de Pascua debe ser confirmado por muestreos in situ de alta resolución. Dentro de las amenazas a largo plazo se incluyen mayor estratificación por cambio climático y acumulación de desechos plásticos. Por último, se destacan las prioridades para la investigación futura. Palabras clave: Isla de Pascua, Isla Salas y Gómez, oceanografía, comunidad planctónica, función biogeoquímica, ecosistema pelágico. The most striking characteristic of the ocean near Easter Island is its clarity, representing the poorest plankton productivity on Earth, in the eastern-central part of the South Pacific Sub-tropical Gyre (SPSG) (Morel et al., 2010). This is a fundamental aspect defining the structure and function of both pelagic and benthic communities, as well as barriers to connectivity among ocean islands and between island habitats and the continents. Therefore, understanding the pelagic nutrient and trophic status in the eastern-central SPSG is essential to evaluate environmental risks implied by global changes or local-scale human activities. This is the motivation for the review of published literature and other available information (e.g., unpublished data archives) about plankton oceanography and biogeochemistry, both of the SPSG and especially the Exclusive Economic Zone (EEZ) defined by Easter Island and Salas y Gómez Island. Since the EEZ does not coincide with any specific ocean region, based on physical, chemical, or biological characteristics, we could not limit this review to data exclusively obtained within the EEZ (where conservation decisions are made). Also, despite relatively recent reviews of the geology and biology of the Nazca and Salas y Gómez province (Galvez-Larach, 2009), knowledge of plankton oceanography and biogeochemistry in the SPSG system is poor and decreases from west to east, with the greatest gaps in the EEZ. In this article we first discuss general principals of the plankton ecosystem, biogeochemical functions in sub-tropical gyres worldwide and the prognostics for these systems in a changing ocean. 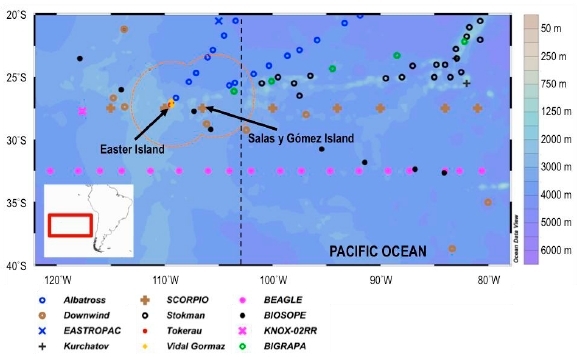 Second, we review scientific efforts in biological oceanography near Easter and Salas y Gómez islands, summarizing the most important scientific expeditions to the Easter Island and Salas y Gómez Island EEZ that contribute to knowledge of planktonic ecosystems and biogeochemical function. Third, we review current knowledge and data on biogeochemical function in the SPSG, focusing on the central eastern section. Fourth, we analyze grand patterns of biodiversity apparent in different planktonic organisms from the coastal upwelling system of Chile crossing the SPSG, which includes the strongest known productivity gradient. Fifth, we discuss the possibility of a pelagic biomass increase near Easter Island and Salas y Gómez Island, i.e. , a possible island mass effect, which would have clear relevance for marine conservation in the EEZ. Finally, we discuss priorities for future research in this region. This article both reviews published literature and presents new analysis of data from public databases. In terms of published literature, we concentrate mostly on the epi-pelagic realm, as the abysso-pelagic realm is essentially unexplored in this region, and only a small number samples have been taken in the upper depths of the meso-pelagic. While much of the data available on biological oceanography in the EEZ can be found published in peer-reviewed international journals, important extant data is not easily obtained since it has only been recorded in government databases or reports (grey literature). This is the case for the data from a cruise (IFOP, 1979b) by the Instituto de Fomento Pesquero-Chile (IFOP) in 1979 (Rojas-Jara, 1980), which collected extensive data on animal zooplankton biomass and diversity in the area, and data from the CIMAR-5 cruise to the EEZ in 1999 (Rojas et al., 2004), much of which has not been published in scientific journals but is available at the CIMAR website (http://www.shoa.cl/n_cendhoc/productos/cimar-5/). Thus, we also analyze or re-analyze diversity and biomass patterns from data sets in "grey literature" to compare them with those observed in various plankton groups on the eastern side of the SPSG in peer-reviewed journals. Incidence and/or abundance data from CIMAR-5 were analyzed for Bray-Curtis similarity using the software PRIMER 6 and EstimateS (Colwell, 2005) to explore relationships between oceanographic characteristics and species-composition. Finally, data were plotted onto maps of Level 3-processed surface chlorophyll data from the SeaWiFS satellite mission (downloaded from the NASA Ocean Color website at http://oceandata.sci.gsfc.nasa.gov/ and processed with the software or of bathymetry using the software Ocean Data View (Schlitzer, R., Ocean Data View, http://odv.awi.de Seadas 6.2). Sub-tropical ocean gyres are oligotrophic areas characterized by very low levels of nutrients in a stratified upper water column (euphotic zone, mixed layer), low biomass and low primary production. Despite low average biomass and productivity, oligotrophic gyres contribute 23-29% of total ocean primary productivity worldwide due to their large areas (Behrenfeld & Falkowski, 1997; Falkowski et al., 2003). The majority of this production is based on the recycling of nutrients within the euphotic zone, which means that the fraction of carbon (C) fixed by photosynthesis that is exported to deeper layers is small (between 0-0.2) compared to mesotrophic or eutrophic regions (where the fraction is >0.4). In total, oligotrophic regions are expected to contribute about 10% of total export production (Falkowski et al., 2003). In sub-tropical gyres, community composition and biomass are expected to exhibit relatively low spatial and temporal (e.g., seasonal) variability in comparison to coastal, temperate, sub-polar, or polar regions (Doney et al., 2003; Behrenfeld et al., 2006; Dandonneau et al., 2008). In contrast to productive waters, seasonal variations in sea surface chlorophyll observed from satellites in ultra-oligotrophic waters are exceptionally tightly coupled to variability in colored dissolved organic matter (CDOM). This suggests that these variations might not reflect true changes in biomass and productivity, but rather seasonal changes in light and mixing regimes (the rate of turbulent injection of more heavily pigmented cells and unbleached CDOM into surface waters, which become bleached by time in sunlight) (Behrenfeld et al., 2006; Morel et al., 2010). In the last decade it has been suggested that the metabolic balance of oligotrophic gyres is heterotrophic (consuming more organic C and O2 than is produced) (Del Giorgio & Duarte, 2002; Duarte & Regaudie-de-Gioux, 2009). Nevertheless, in situ dissolved O2 data have been interpreted to indicate that these regions are still net positive producers of O2 (Riser & Johnson, 2008). This debate highlights the importance of considering possible external subsidies of matter and energy in oligotrophic systems, such as the westward propagating meso-scale eddies discussed by Andrade et al. (2014). Sub-tropical gyres are in fact zones of particulate matter accumulation, as evidenced in the accumulation of plastic garbage in each ocean gyre (Law et al., 2010; Maximenko et al., 2012; Eriksen et al., 2013), demonstrating that mechanisms exist to import matter from external sources. It is not yet clear how quantitatively important such imports of external matter are to gyres in comparison to local primary productivity. With an area of 18x106 km2, the SPSG is the largest of the sub-tropical gyres yet one of the least studied ocean regions, particularly the central eastern section within which Easter Island and Salas y Gómez Island are located. Between 1904 and 2010, only 10 expeditions entered this region with the capacity for biological and chemical oceanography and/or investigating plankton communities. Six other expeditions passed close (but did not enter) the EEZ, obtaining relevant data on the central eastern part of the SPSG (Table 1, Fig. 1). Of these 16 cruises, most conducted sampling at the end of austral spring/beginning of austral summer (10 cruises occurring Oct-Feb). The BIGRAPA expedition of 2010, from which data is just beginning to be published, was the only one to occur in austral winter (Aug.). Important physical-chemical data from two cruises (CIMAR-5 and IFOP, 1979) have never been published in peer-reviewed journals (data is available from Rojas-Jara, 1980 and Rojas et al., 2004; as this data may not be easily accessible to most readers, we provide two supplementary files compiling relevant data). The Easter Island- Salas y Gómez Island EEZ thus remains very poor in data coverage despite its oceanographic importance. Table 1. Cruises and expeditions yielding information on the plankton ecosystem and/or pelagic biogeochemical function within or nearby to the Easter Island and Salas y Gómez Island EEZ. Data-types obtained: zoo: zooplankton, nut: nutrients, CTD: profile of salinity, temperature, and density with depth, HCs: hydrocarbons, chl: chlorophyll, phyt: phytoplancton, DOM: dissolved organic material, POM: particulate organic material, DOC: dissolved organic carbon, POC: particulate organic carbon, C-ant: anthropogenic carbon, C-fix: carbon fixation, N-fix: fixation of N2, Fe: iron, bact: bacteria, peuk: picoeukaryotes, sed: sediments). Key citations are listed below and represent either the official cruise report and/or the key publication from which data was used in the present study. 1Agassiz (1906); 2Fisher (1958); 3Mullin (1969); 4Heinrich (1971); 5Sagi (1977); 6Rojas-Jara (1980); 7Vinogradov (1991); 8Palma (1999); 9WOCE cruise number 31DSCGC94; downloaded Irom Clivar & Carbon Hydrographic Database at http://cchdo.ucsd.edu, 10Robledo & Mujica (1999); 11Rojas et al. (2004); downloaded Irom http://www.shoa.cl/n_cendhoc/productos/cimar-5/; 12Grob et al. (2007b); 13Claustre et al. (2008); 14D'Hondt et al. (2009, 2011); 15WOCE cruise number 33RO20071215, downloaded from Clivar & Carbon Hydrographic Database at http://cchdo.ucsd.edu, 16Farías, et al. (2013). Figure 1. Map of the study area, showing the station locations of cruises discussed in the text and bathymetry. For clarity, the CIMAR-5 and IFOP-1979 cruises are not included in this map, as maps of the stations from those cruises are included in subsequent figures. The WOCE P18 cruise track is represented by a dashed line without indicating individual stations, which were spaced at 0.5°. The orange dotted line represents the boundaries of the EEZ. 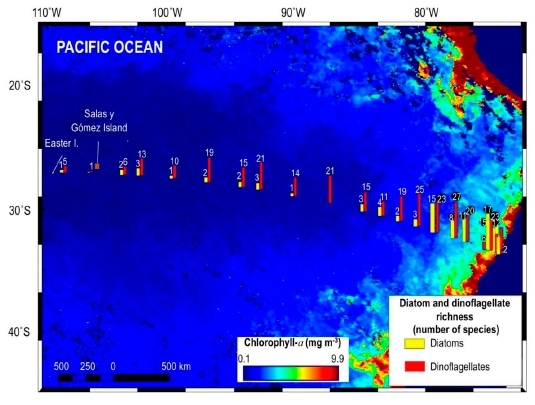 In a study of six oligotrophic gyres using 10 years of accumulated satellite data, an area centered near Easter Island (100°-125°W, 20°-30°S) was found to have the lowest concentrations of pigments and colored dissolved organic matter (CDOM) (Morel et al., 2010). Likewise, the clearest natural ocean waters on Earth, with a light scattering coefficient at 350 nm indistinguishable from purified seawater, was detected at depths of 300-350 m between the longitudes of 115°-118°W, just outside the Easter Island EEZ (Twardowski et al., 2007). In this sense, the waters of the SPSG near Easter Island represent an extreme environment. 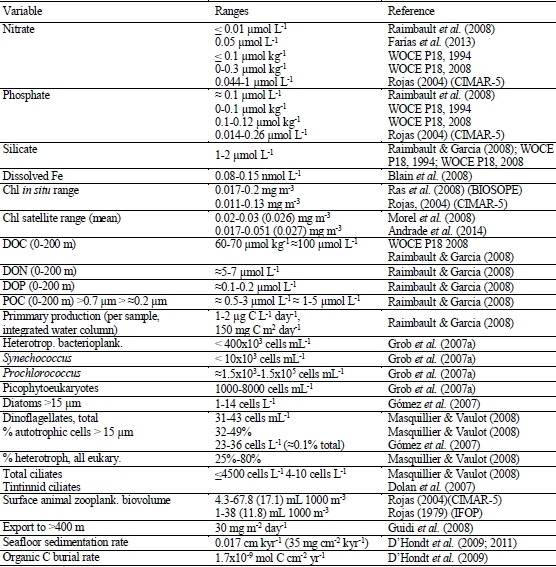 Key biogeochemical and ecological parameters are summarized in Table 2 and discussed below. Table 2. 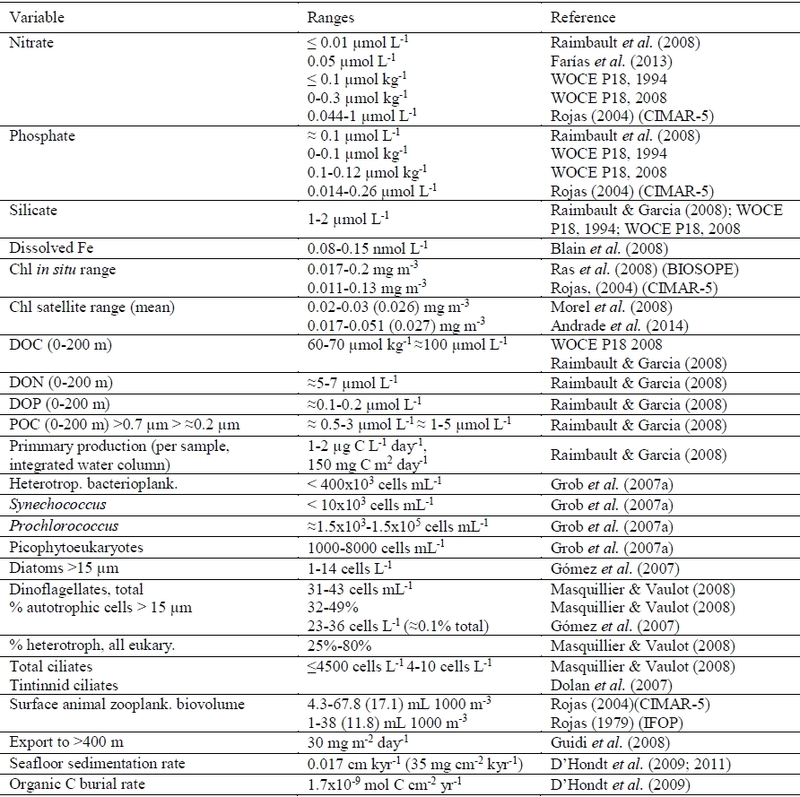 Example ranges of biogeochemically-important variables in the central-eastern SPSG, and associated references. Primary productivity ranges are given per volume (by sample) and integrated over the water column. Export production estimated at 400 m (Export >400 m). Organic C burial rates were measured at the seafloor. Chlorophyll and CDOM exhibit very tightly coupled seasonal co-variations, suggesting that seasonal variations in sea surface chlorophyll might not reflect true biomass variations. Instead variations in the depth of the mixed layer and level of mixing might cause more unbleached CDOM and higher pigmented cells to be transported towards the surface in the winter, whereas cells and CDOM near the surface in the summer have been exposed to solar bleaching for longer on average (Morel et al., 2010). As is typical of oligotrophic waters worldwide, this plankton ecosystem is dominated by the smallest size fraction of cells, picoplankton (0.2-3 μm diameter). Size-fractionated chlorophyll measurements in the CIMAR-5 dataset indicated that 60-70% of total chlorophyll passed through a 2.0 μm filter (Rojas et al., 2004). During the BIOSOPE cruise, distinct approaches yielded similar conclusions. One approach, relating size classes to accessory pigments, estimated that picoplankton contributed 53% (49-57%) of total phytoplankton biomass, while microplankton (20-200 μm) contributed only 6.5% (range 6.2-7.2%) (Ras et al., 2008). Likewise, combining optical measurements with flow cytometry estimated that eukaryotic picoplankton contributed 30-50% of total phyto-plankton biomass (Grob et al., 2007a). Nevertheless, phototrophic biomass was only a small fraction of total biomass: Heterotrophic bacterioplankton and small detritus particles contributed up to 83% of total particulate organic carbon in the SPSG. Bacterio-plankton also represented 83% of cells (=4x105 mL-1 near Easter Island), the green cyanobacterium Prochlorococcus represented about 27% of all cells (<2x103 mL-1 at surface to =1.5x105 mL-1 at the chlorophyll max depth), while eukaryotic picoplankton never represented more than 3% numerically of all cells but contributed approximately half of photosynthetic carbon biomass (Grob et al., 2007a). Along a similar transect (the Beagle cruise) across the SPSG further south (at 32.5°S) these proportions were often even higher (Grob et al., 2007b). Meanwhile, in the stations nearest to the Easter Island EEZ, diatoms and dinoflagellates >15 μm were in the ranges 9-14 L-1 and 23-36 L-1, respectively (Gómez et al., 2007), or on the order of 10 million times less abundant than heterotrophic bacterioplankton, 4 million times less abundant than Prochlorocuus, and 50-250,000 times less abundant than eukaryotic picoplankton. The eukaryotic microbes detected highlight the potential importance of heterotrophy in central SPSG surface waters. Throughout the gyre between 0-50 m depths, heterotrophs were up to 75-80% of all eukaryotic cells when measured directly by epifluorescence microscopy (Masquelier & Vaulot, 2008). In deeper euphotic zone communities, where photosynthetic cells dominated, dot-blot, clone library, and molecular characterization of cells sorted by flow cytometry found that phylogenetic groups that are usually mixotrophic, such as Haptophytes (Prymnesiophytes) or dinoflagellates, or that might contain mixotrophs (such as the Chrysophyceae among photosynthetic Heterokonts/Stramenopiles) were important or dominant among chlorophyll-containing cells (Lepère et al., 2009; Shi et al., 2009, 2011). Relatively high abundances of bacteriochlorophyll-containing bacteria (heterotrophs capable of performing anoxygenic photosynthesis) were also reported in the oligotrophic SPSG, again indicating the importance of organisms with mixed heterotrophic and phototrophic metabolisms in this environment (Lami et al., 2007). Vertical biomass distribution in the SPSG consists of low concentrations near the surface with very deep maxima, except in the case of bacterioplankton and particulate organic matter (POM). The maximum concentration of photosynthetic biomass and pigments is usually quite deep in stratified mesotrophic and oligotrophic waters, especially in tropical and sub-tropical latitudes, forming a Deep Chlorophyll Max (DCM) (Mann & Lazier, 2006). The DCM depth reported from the BIOSOPE cruise was located between 100-250 m, mostly centered at >150 m (Grob et al., 2007a; Ras et al., 2008). The maximum concentration of Prochlorococcus cells was normally at 80-150 m while that of pico-eukaryotes was similar to that of total chlorophyll (100250 m). Larger particulate matter also showed maxima below 100 m (Guidi et al., 2008; Stemmann et al., 2008). In contrast, both heterotrophic bacterioplankton and smaller particulate organic matter exhibited more homogeneous vertical distributions in the surface, decreasing below the euphotic zone (Grob et al., 2007a; Raimbault et al., 2008). Vertical distributions of chlorophyll, Prochlorococcus, Synechococcus, and eukaryote pico-phytoplankton were reported as more homogeneous and shallower (in the first 100 m) in a transect across the SPSG at 32.5°S on the BEAGLE cruise in the spring of 2003 (measurements made by the same investigators as on the BIOSOPE cruise) (Grob et al., 2007b), indicating that vertical distribution may change strongly with latitude. A major caveat interpreting phytoplankton biomass patterns from the CIMAR-5 data is that chlorophyll measurements were rarely made below 100 m and no measurements of cell abundances were reported. Meso-plankton biomass (organisms >200 μm, mostly animals), has been reported to be extremely low in the SPSG, both when captured by nets and when measured by SONAR scattering (Fisher, 1958). On the CIMAR-5 cruise, the bio-volume of zooplankton captured at stations within the EEZ was on average only 10% of the bio-volume captured at stations within the area of coastal upwelling in the Humboldt Current System (between 70°-76°W) (Fig. 2). The IFOP-1979a cruise in the EEZ reported zooplankton bio-volumes that were 20% of those found on the IFOP-1979b cruise (data from <76°W in waters off northern Chile) (10 ± 9 mL 1000 m-3 vs 49 ± 25 mL 1000 m-3). Both the IFOP-1979b and CIMAR-5 cruise data measured zooplankton biomass with integrated net tows, only reaching depths of 300 and 200 m, respectively. Both zooplankton and phytoplankton typically exhibit pronounced heterogeneous vertical distributions in open oceans (Longhurst, 1976). The deep scattering layer (where zooplankton is of highest concentration during the day and reflects SONAR signals) was found to be diffuse but located well below 300 m in waters near Easter Island on the Downwind cruise (Fisher, 1958). Also, some zooplankton, such as many euphausiids (Brinton, 1967), have sufficient visual detection and jump responses to avoid nets during daytime. Copepods and euphausiids typically exhibit pronounced diel vertical migration (Brinton, 1967; Bollens & Frost, 1989). Thus, the IFOP-979 and CIMAR-5 methodology may miss an important fraction of integrated zooplankton bio-volumes. Figure 2. Bio-volume of total zooplankton in stations sampled in the CIMAR-5 cruise transect from the Chilean coast to Easter Island. The dotted orange line indicates the boundary of the EEZ. Direct measures of total primary production showed primary production throughout the central gyre to be very low, less than 0.2 μg C L-1 day-1 or 150 mg C m-2 day-1 (Raimbault & Garcia, 2008). This is much lower than the long-term climatological ranges for oligotrophic stations in the North Atlantic (Bermuda Atlantic Time-series Study) and North Pacific (Hawaii Ocean Time-series), where primary productivity ranges from approximately 300 to 600 mg C m-2 day-1 (Falkowski et al., 2003). Curiously, despite the previously mentioned changes in vertical distributions of phytoplankton, Raimbault & Garcia (2008) reported no deep productivity maximum. The f ratio represents the ratio of "new" production to total primary production, which includes the proportion of production based on recycling of nutrients within the euphotic zone, and generally ranges from below 0.2 in oligotrophic waters to 0.4-0.7 in highly productive waters (Falkowski et al., 2003). The f ratios estimated in the SPSG reached minimums near 0 at the longitude of Easter Island (Raimbault et al., 2008). This ratio also determines the proportion of primary production that can be exported to deeper waters (Falkowski et al., 2003). Indeed, the rate of accumulation of sediments on the ocean floor was reported to be extremely low on the Knox 02RR cruise just west of the EEZ (27.68°S, 117.57°W) at only 35 mg cm-2 per 1000 years (D'Hondt et al., 2009, 2011). Thus, Easter Island is in the middle of the least productive waters on earth. However, there is a measurable export production. Export to depths of >400 m was estimated to be 30 mg m-2 day-1 (>230 times lower than in coastal waters of Chile) (Guidi et al., 2008). This falling organic C will be sequestered for long periods of time due to the scarcity of meteorological events that can mix those waters to the surface, and is an essential resource for deep-sea communities. The scarce biomass and low primary production in the SPSG has been explained by the lack of fixed dissolved inorganic nitrogen (DIN, including nitrate, nitrite, and ammonia) in the euphotic zone. Nitrate levels in the euphotic zone in the SPSG have consistently been reported to range from below detection limits to only 0.01 μmol L-1 in the gyre center (100°-125°W), including within the EEZ (Sagi, 1977; Bonnet et al., 2008; Raimbault et al., 2008; Farías et al., 2013). Other forms of DIN were also undetectable or very low (<0.05 μmol L-1) near the surface (Raimbault et al., 2008). Levels of phosphate (P) were reported to have minimums of 0.1 μmol L-1 in the surface, only reaching >0.5 μmol L-1 below 250 m (Raimbault et al., 2008). These DIN:P ratios are much less than the 16:1 (Redfield ratio) required for balanced phytoplankton growth, and despite the relatively low P levels, P is not limiting. Dissolved silica is also low but appears not to be limiting, with values of 1-2 μmol L-1 throughout the SPSG (Raimbault et al., 2008). High 15N:14N (∂15N) ratios in DIN were interpreted to indicate that sub-surface waters originated from the South American coastal upwelling zone, where anoxic marine zones lead to a high loss of nitrate, leaving low N:P ratios (Raimbault et al., 2008). Curiously, concentrations of dissolved organic nitrogen (DON) were much higher, reaching levels >5 μmol L-1 even near the surface in central gyre waters (including stations near Easter Island), although dissolved organic phosphorous was similar to phosphate levels (Raimbault et al., 2008). Relatively high levels of dissolved organic carbon (DOC up to 125 μmol L-1) have been reported in the SPSG. This DOC is, in general, N-poor, which has been suggested to limit its assimilation and metabolism by heterotrophic microbes (Raimbault et al., 2008). That explanation would make sense if a large portion of the DON pool was in forms that also cannot be metabolized by phytoplankton, which would otherwise be expected to use this source of fixed N. Consistently, microcosm experiments have shown that planktonic microbial communities in the SPSG responded strongly to the addition of nitrate, indicating that primary and secondary production are indeed strongly limited by the lack of fixed N (Bonnet et al., 2008). Major differences between the central eastern SPSG and other oligotrophic gyres are related to the role of N2-fixation in the N cycle and responses to iron (Fe) fertilization. The availability of dissolved phosphorous, despite extremely low DIN, would normally suggest a good niche for N2-fixing organisms. In the oligotrophic Atlantic sub-tropical gyres, N2-fixing cyanobacteria can provide up to half of new production (Mouriño-Carballido et al., 2011), and N2-fixers are important in the North Pacific gyre (Karl et al., 1997, 2012) and in the western SPSG (Raimbault et al., 2008). N2-fixation has been demonstrated in the SPSG, including in waters near Eastern Island, but, in contrast with other gyres, N2-fixation is very limited and represents only a small fraction of total N cycling in all of the central and eastern SPSG. Nevertheless, in the central and eastern SPSG, N2-fixation, not injection of NID from deeper waters by upwelling or turbulence, was estimated to be responsible for almost all new production (Raimbault et al., 2008). N2-fixation has a high Fe demand. Levels of dissolved Fe have been found to be exceptionally low in the central eastern SPSG, ranging from 0.08-0.15 nM in the upper 300 m (Blain et al., 2008), where subsurface waters are very old and dust deposition is extremely low (Wagener et al., 2008). In other oligotrophic environments, N2-fixation is supported by dust deposition. For example, sub-tropical Atlantic N2-fixation by communities dominated by the colonial cyanobacterium Trichodesmium is stimulated by the high input of Saharan dust which provides Fe and P (Mills et al., 2004; Moore et al., 2009). Based on these considerations, one might expect the SPSG waters to respond to Fe or dust addition. This could be relevant to communities near Easter Island and Salas y Gómez Island, as natural Fe-fertilization by islands supports strong increases in productivity in other ocean regions (Blain et al., 2008; Pollard et al., 2009). 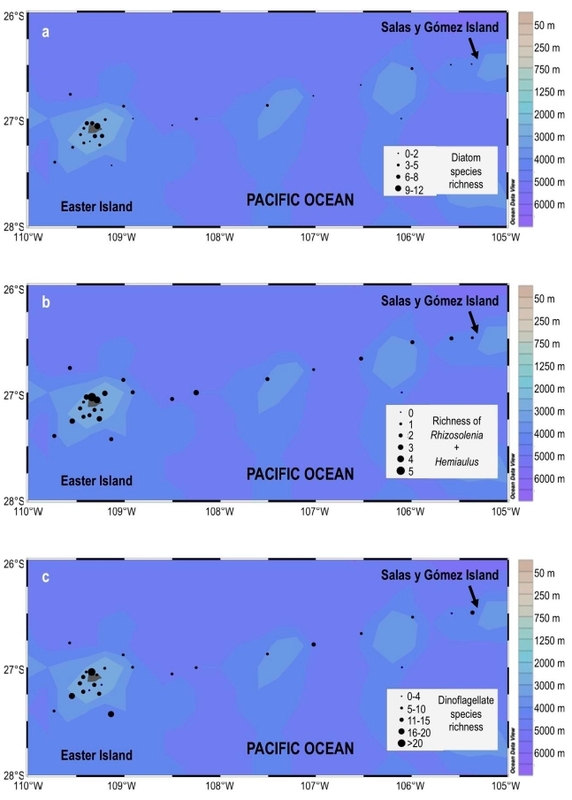 Despite this expectation, short-term on-board microcosm experiments with SPSG phytoplankton communities close to Easter Island found that primary production was stimulated only when nitrate was added, not when Fe alone was added, nor did Fe addition increase photosynthetic efficiency (Bonnet et al., 2008). In contrast, similar experiments conducted on communities from a High Nitrate Low Chlorophyll: region (HNLC; where chlorophyll is low despite relatively high surface nitrate levels) in the western SPSG found that primary production and photosynthetic efficiency was strongly stimulated by Fe addition alone (Bonnet et al., 2008). This lack of a short-term response could be due to co-limitation by P (N2-fixation has higher P requirements as well) or the absence or incompatibility of organic ligands to maintain bio-available Fe. Alternatively, the biomass of N2-fixers that could respond may have been too low for those short-term experiments, and the sparse phototrophic community available included organisms whose physiologies are highly adapted to Fe-limitation. Although large colonies of N2-fixing cyanobacteria have long been considered important in the Atlantic gyres (e.g., Mouriño-Carballido et al., 2011) and in the western and southern extremes of the SPSG (Campbell et al., 2005; Moutin et al., 2005; Hashihama et al., 2010), these organisms have not been reported in the central or eastern regions of the SPSG (e.g., Halm et al., 2012). Curiously, analysis of satellite data suggested Trichodesmium blooms might occur in the tropical-central SPSG during the months of January-February (Westberry & Siegel, 2006). This has yet to be confirmed by in situ samples. Rhizosolenia and Hemiaulus, two diatom genera in which many species contain N2-fixing cyanobacterial endosymbionts, do appear to be well represented in the central and eastern area of the SPSG, including waters near Easter Island and Salas y Gómez Island in the CIMAR-5 data. These two genera may be very important in new and export production in the North Pacific Sub-tropical Gyre (Karl et al., 2012). Nevertheless, a recent study found that heterotrophic N2-fixing bacteria and possibly photoheterotrophic unicellular cyanobacteria appeared to dominate N2-fixation in the SPSG (Halm et al., 2012), which is very different from the N2-fixing communities dominated by phototrophs seen in other gyre systems (see above) and in the western SPSG (Hashihama et al., 2010). As heterotrophs, these organisms are clearly different than the better-known colonial N2-fixing cyanobacteria, and might respond differently to Fe-addition if, for example, they were also limited by availability of organic substrate. In summary, these considerations suggest the ecosystem might respond to longer-term increases in Fe-availability despite the lack of response in short-term experiments. With a few exceptions, almost all studies of plankton biodiversity in the SPSG have aimed to describe taxonomic/phylogenetic richness or the distribution of particular groups at large scales. The most important studies focused on broad phylogenetic description of eukaryotic picoplankton diversity, diatom and dinoflagellate, tintinnid ciliate, and siphonophore diversity, with especially detailed and enlightening studies of tintinnids and siphonophores (Dolan et al., 2007; Palma & Silva, 2006). Diversity patterns suggest that the SPSG exhibits very high total plankton diversity but the taxonomic levels at which high diversity is exhibited varies between groups. The most detailed analysis of diversity patterns for unicellular organisms across the SPSG and surrounding productive waters was performed on tintinnid ciliates, an important functional group of herbivores controlling pico- and nanoplanktonic microbes, from samples taken on the BIOSOPE-2004 cruise (Dolan et al., 2007). A total of 149 morphotypes were reported across the entire South Pacific basin, a figure which is very high (the same authors found only 87 morphospecies in a transect from the northern Mediterranean to the south of the Indian Ocean using comparable methodology). 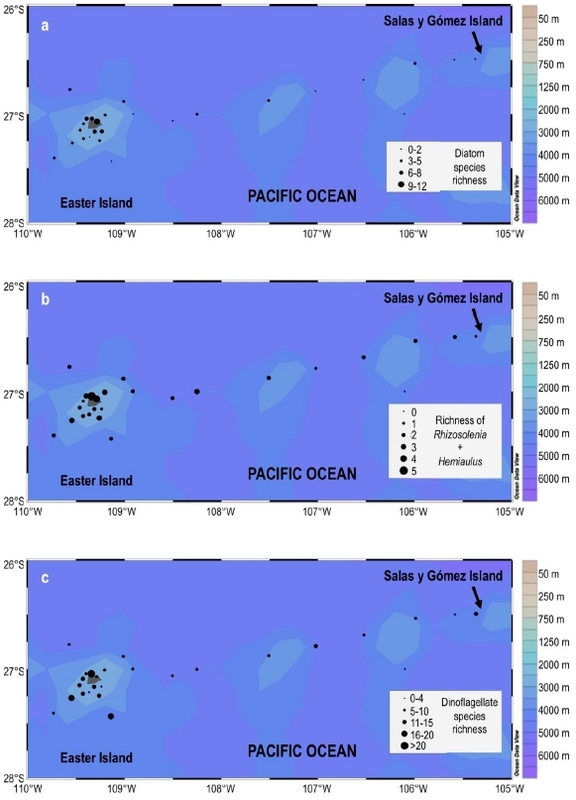 Species-richness remained high at all stations across the SPSG (=30/station), with 19-41 species registered at each station within the Easter Island/ Salas y Gómez Island EEZ. Diversity indices correlated negatively with community biomass (approximated by chlorophyll) and the total concentrations of tintinnid cells, while correlating positively with the DCM. In other words, tintinnid diversity increased as community biomass and productivity declined. An interesting conclusion of this study was that rank-abundance distributions for tintinnids generally followed log-series curves, which the authors interpreted to suggest that the ecologically equivalent forms accumulated by high dispersal and random colonization from a very large and diverse meta-community, and species were not subject to high competition within the functional group (essentially community biomass was too low to provide opportunities for competition). In functional diversity, the dominant eukaryotic microbes from the surface until the DCM were heterotrophic nano- and pico-eukaryotes (Masquelier & Vaulot, 2008). Between 150-200 m, heterotrophs represented only 20-40% of eukaryotic microbes, but below 250 m, they increased to 100%. Autotrophs were the numerically dominated eukaryotic organisms <2 μm (60%), but not between 2-5 μm (20-30%) (Masquelier & Vaulot, 2008). 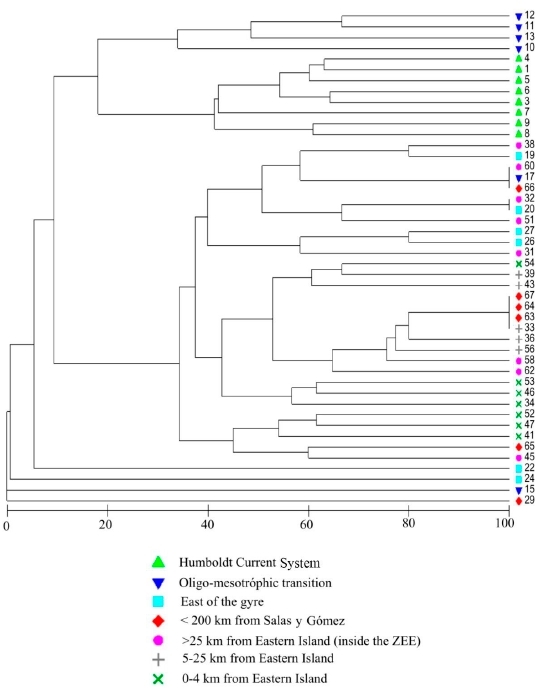 Parallel work showed this diversity was dominated by organisms in the classes Chrysophyceae and Prymnesiophyceae, the Prasinophyceae, and a possible new clade of the Haptophyte phylum (Lepère et al., 2009; Shi et al., 2009, 2011). Pronounced changes in the relative dominance of these taxa were reported between different surface waters and between the surface and DCM. Distinct molecular and pigment analyses in these studies agreed that two taxa that are normally prominent in oceanic waters, Pelagophyceae (Phylum Heterokonta) and Mamiellophyceae (green microalgae within the Prasinophyceae), were notably under-represented or sometimes absent in the SPSG. Interestingly, the majority of DNA sequences analyzed from the most oligotrophic SPSG waters were distinct not only from previously described organisms in culture but also from sequences or organisms sampled in other highly oligotrophic ocean regions (such as the central Mediterranean Sea) using the same molecular approaches. Rarefaction curves of 16S rDNA clone libraries suggested that pico-eukaryoes in the ultra-oligotrophic waters of the central and eastern SPSG exhibited very low species-level or genus-level diversity (Lepère et al., 2009). This same study suggested high pico-eukaryote species-level or genus-level diversity in mesotrophic waters at the gyre edge, and moderate to low diversity in the highly productive upwelling waters of the Humboldt Current System. Worldwide analysis of the morphological diversity of larger phytoplankton has suggested that these organisms exhibit a unimodal or bell-shaped distribution of species- or genus-level diversity versus phytoplankton biomass (Irigoien et al., 2004). Additionally, the patterns seen in molecular analyses of pico-eukaryotic plankton suggest that this group may show a similar patter, with the highest biodiversity at moderate levels of productivity and community biomass. Thus, although the SPSG exhibits a high diversity at high taxonomic levels (and perhaps high β diversity), species-level pico-eukaryote diversity within a given water sample may actually be very low. Data from both the CIMAR-6 and BIOSOPE cruises suggested that diatom and dinoflagellate species richness within the SPSG is low (Fig. 3), although dinoflagellate richness was high when stations of similar position and oceanographic characteristics were aggregated (not shown), similar to patterns seen in BIOSOPE data (Gómez et al., 2007). Diatom species-richness in the CIMAR-5 dataset increased monotonically with productivity, reaching its highest levels in the productive Humboldt Current System waters and its lowest levels in the most oligotrophic gyre waters (Fig. 4a). In contrast, dinoflagellates showed a unimodal (bell-shaped) distribution of species-richness versus community biomass (chlorophyll-α) (Fig. 4b). Figure 3. Richness (number species) of diatoms and dinoflagellates in stations sampled along the CIMAR-5 cruise transect from the Chilean coast to Easter Island. Colors indicate SEAWIFS surface chlorophyll data from October, 1999. Figure 4. 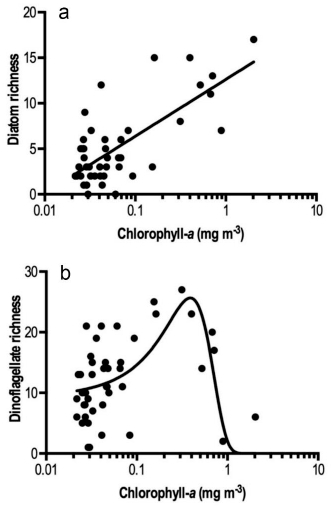 Relationships between diatom and dinoflagellate species richness versus phytoplankton biomass (estimated by the average chl-α concentration reported between 0-50 m depth). Data from CIMAR-5 cruise. a) Diatom species-richness versus chl-α. Curve-fit is semi-log regression: slope = 6.25 ± 0.89, R2 = 0.530. The Akaike Information Criteria test indicated that the semi-log regression was a better fit than a linear regression (ratio of probabilities = 78) and that the difference of the slope from 0 was significant (P < 0.0001), b) dinoflagellate species-richness versus chl-α. Non-linear regression fit to Gaussian curve is shown: Amplitude = 25.7 ± 3.2, mean = 0.389 ± 0.030, standard deviation = 0.272 ± 0.033, R2 = 0.361. Akaike Information Criteria indicated that the Gaussian-fit was better than a semi-log fit or a fit to a linear function with slope 0 (probability ratios of 1243 and 2865, respectively). Diatoms are classically described as mostly r-type, organisms capable of exploiting new resources with fast growth after mixing or upwelling events, whereas most dinoflagellates appear to be more k-type, organisms adapted to slow growth and able to survive under oligotrophic conditions (Margalef, 1978). This ecological difference may underlie the type of diversity-productivity relationship a plankton group exhibits across this extreme productivity gradient (tintinnid-type or dinoflagellate-type versus diatomtype). It is noteworthy that several potentially toxic phytoplankton are listed in the CIMAR-5 data report from the EEZ waters. For example, the diatoms Pseudo-nitzschia multiseries and P.-n. pseudodelicatissima, which are often domoic-acid producers (Van Dolah, 2000; Trainer et al., 2012), were reported in CIMAR-5 data. Likewise, several dinoflagellates of the genus Dinophysis, which is often toxic, were also reported. Both of these genera are often natural components of oceanic waters. However, P.-n. multiseries is usually considered a coastal form. We caution that toxicity is highly variable both among and even within species, and, that species-level taxonomic definitions are often difficult and fluid within these organisms (Trainer et al., 2012). Detailed studies on siphonophores provide sufficient species-level data to analyze changes in diversity both across the eastern SPSG and within the EEZ. This is the only animal zooplankton group for which extensive data is available in the EEZ: 13 species have been reported near Easter Island, Salas y Gómez Island or surrounding waters (Palma, 1999; Palma & Silva, 2006). Palma & Silva (2006) noted that siphonophore communities show a distinct separation between the sub-tropical waters of the gyre and the sub-antarctic waters east of 78°W (in the Humboldt Current upwelling zone). Although siphonophore abundance decreased westward entering into the oligotrophic gyre center in the CIMAR-5 data set, both species richness (Palma & Silva, 2006) and Shannon diversity increased (new analysis, this study) (Fig. 5). Species-richness and Shannon diversity were highly correlated (Fig. 6a). Shannon diversity but not species-richness showed a significant negative relationship with siphonophore abundance (Fig. 6b). Similar to the pattern seen in tintinnids, both species richness and Shannon diversity showed clear negative relationships with measures of community plankton biomass (chlorophyll-α and zooplankton biomass) (Figs. 6c-6d). Figure 5. Abundance and diversity (Shannon index) of siphonophores in stations sampled during the CIMAR-5 cruise transect from the coast of Chile to Easter Island. Figure 6. Patterns of siphonophore diversity (species-richness and Shannon index, without grouping of stations) in the CIMAR-5 data. a) Shannon index versus species-richness. Linear regression: slope = 0.150 ± 0. 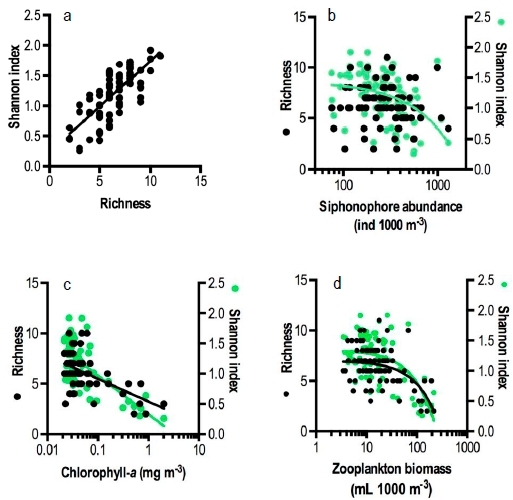 015, R2 = 0.548, P < 0.0001, b) species-richness and Shannon index versus siphonophore abundance. Linear regression for species-richness versus abundance was not significant. Linear regression for Shannon index versus abundance was significant: slope = 7.70x10-4 ± 1.86x10-4, R2 = 0.176, P < 0.0001, c) species-richness and Shannon index versus chl-α (mean concentration between 0-50 m). Semi-log regressions were significant (P < 0.001) in both cases. For richness, slope = -2.26 ± 0.63, R2 = 0.302. For Shannon index, slope = -0.636 ± 0.087, R2=0.495, d) species-richness and Shannon index versus zooplankton biovolume, captured in vertical tows. Linear regression for richness: slope = -2.31x10-3 ± 0.44x10-3, R2 = 0.254, P < 0.0001. Linear regression for Shannon index: slope = -5.38x10-3 ± 0.85x10-3, R2 = 0.333, P < 0.0001. Data on pelagic amphipods (Crustacea, Malacos-traca) is available for the Humboldt Current System to 100°W (reaching the highly oligotrophic waters of the eastern SPSG) (Vinogradov, 1991). Although the pelagic amphipod community composition was similar to that found in the North Pacific, the species-richness found in the eastern SPSG was exceptionally high, similar to what was seen for siphonophores and tintinnids. Some information is also available for euphausiids (Crustacea, Malacostraca), (Cnidaria, Hydrozoa). Within the Easter Island/Salas y Gómez Island EEZ, 33 species of euphausiids have been reported from the CIMAR-5 and previous cruises (Robledo & Mujica, 1999; Rojas et al., 2004). The most important euphausiids in this area, such as Euphausia brevis and Stylocheiron affine, have broad geographic distributions across the Pacific basins. Some species, such as Stylocheiron carinatum and Euphausia mutica, appear to be excluded from the central eastern SPSG, despite normally characterizing oligotrophic and mesotrophic waters (Brinton, 1962). Other species, such as Nematoscelis tenella and Thysanopoda pectinata, exhibit rare appearances in EEZ waters. At least one species, Th. cristata, reaches its eastern limit near Easter Island. As yet there is very little published information on one of the most important zooplankton groups, copepods (Crustacea, Maxillopoda). Two calanoid copepods, Mesocalanus lighti and M. tenuicornis, have been reported in the central eastern SPSG near the EEZ (as Calanus lightii and C. tenuicornis in Mullin, 1969). An analysis of the distribution of the epipelagic and pleustonic copepods in the family Pontellidae in the Eastern South Pacific only covered the area from the South American coast to 85°W (Heinrich, 1971). No copepods were recorded in CIMAR-5 data, simply due to a lack of analysis. Copepods were normally 10-30-fold more abundant than other animal zooplankton in data reports from the IFOP-1979 cruise, although species composition was not recorded. Thus, for two key functional groups, euphausiids and copepods, there is no data available to permit comparisons of diversity patterns to those identified in tintinnids, siphonophores, or other plankton groups. A list of all planktonic taxa currently registered in the Easter Island/Salas y Gómez Island EEZ and surrounding SPSG waters has been compiled (Appendix 1). This list, which contains 293 species or genera, is artificially low for several reasons. First, sampling to date has been very low. Second, the dominant organisms are microbial cells. Very few can be cultured or identified morphologically and no consensus even exists for a species-concept in bacteria and archaea (Doolittle, 2012). Finally, most microbes, including eukaryotes, are now identified principally through molecular methods (DNA sequences or fluorescence in situ hybridization with targeted probes) or pigment signatures, and these methods usually do not result in species- or even genus-level phylogenetic resolution. Nevertheless, this list could still be useful for future questions about the occurrence of potential invasive or toxic species. Analyses of satellite data indicated an increase in surface chlorophyll levels near Easter Island (Andrade et al., 2014), although levels were still very low compared to coastal waters and mesotrophic oceanic waters around the Juan Fernandez Archipelago. Likewise, direct measures from the CIMAR-5 cruise indicated surface chlorophyll values were about 70% higher in the 14 stations within 25 km of Easter Island (0.048 ± 0.016 mg m-3) than in 12 stations more than 25 km from Easter Island (but within the EEZ) (0.028 ± 0.006 mg m-3) and the 9 stations close to Salas y Gómez Island (0.029 ± 0.005 mg m-3), a difference which was statistically significant (ANOVA P = 0.0001). The increase near Easter Island also contrasts the prevailing trend of diminishing surface chlorophyll (to a minimum of 0.017 mg m-3 in the SPSG center) as reported, for example, in the BIOSOPE cruise. 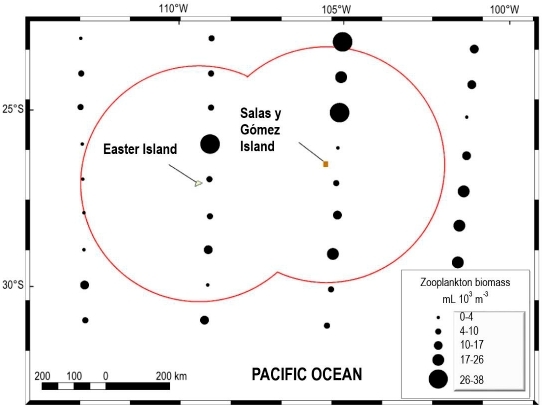 These analyses suggest that Easter Island, although possibly not Salas y Gómez Island, induces an island-mass effect, the increase of plankton biomass and/or productivity often observed around oceanic islands. Although this effect appears relatively small, it may provide crucial energy to both pelagic, benthic, and near-shore ecosystems around Easter Island. Island-mass effects can have a variety of causes, of which three classes are most important to consider here (Hasegawa et al., 2009). First, an island can be a direct source of nutrients that stimulate plankton. This is clearly observed around the Crozet and Kerguelen islands in the Southern Ocean, which add dissolved Fe to Fe-limited waters (Blain et al., 2008; Pollard et al., 2009). Second, an island can induce mixing or upwelling of deeper waters, injecting nutrients into the surface. Finally, the same island-induced mixing of the upper water column can cause an apparent island-mass effect even if there is no increase in integrated water column productivity or biomass: the vertical distribution of planktonic biomass and pigment concentrations in oceanic waters typically exhibits a deep maximum at or below 100 m. Simply increasing mixing will bring deeper waters, that are higher in biomass and contain cells that are richer in pigment, to the surface (Hasegawa et al., 2008; Morel et al., 2010). The CIMAR-5 cruise did not collect samples for chlorophyll-α deep enough to determine either changes in integrated phytoplankton biomass or its depth distribution. However, the dataset includes size-fractionated chlorophyll measurements. As productivity increases, the importance of larger nano- and micro-planktonic phytoplankton generally increases (Marañón et al., 2001). Fertilization stimulates the growth of all phytoplankton, but larger cells appear to escape increased grazing whereas grazers on picophytoplankton can keep up with their increases in growth since this grazing is performed by other smaller (heterotrophic) cells that also respond rapidly to fertilization (Cavender-Bares et al., 1999; Landry et al., 2000). In the CIMAR-5 dataset, the proportion of total chlorophyll passing through 2 μm filters increased near Easter Island, reaching 77% in the southeast of the island. This is opposite the expected trend if there were a true increase in integrated productivity near the island. However it may be that in these ultra-oligotrophic waters, picoplankton are able to respond to fertilization and escape grazing as even their grazers are so dilute as to be severely encounter-limited. Generally, there was a modest tendency to increased diatom and dinoflagellate species richness towards Easter Island (Fig. S1). Diatom species incidence data from the CIMAR-5 cruise shows that the communities of these organisms were generally differentiated according to distance east-west along the whole transect from the continent (Fig. 7, S2). However, communities within 4 km of Easter Island were distinct from communities 5-25 km from the island in comparison to the rest of the gyre according to Bray-Curtis dendogram analysis (this study). Indeed, aggregated species richness in stations within 4 km of the island was 50-250% higher than in surrounding waters, eastern gyre waters, and even waters from the mesotrophic-oligotrophic transition between the Humboldt Current System waters and the SPSG. In contrast, the aggregated richness from stations in the range of 5-25 km was not especially high. The species composition in the waters within 4 km included taxa such as Skeletonema costatum and the spore former Leptocylindrus danicus, which are normally coastal and/or upwelling related (Hasle & Syvertsen, 1997; Horner, 2002). However, Cylindrotheca closterium, a neritic species (Horner, 2002) also appeared in samples, which might instead suggest that a very neritic insular community (perhaps growing mostly in intertidal pools or small bays) occasionally appears in nearby pelagic samples. 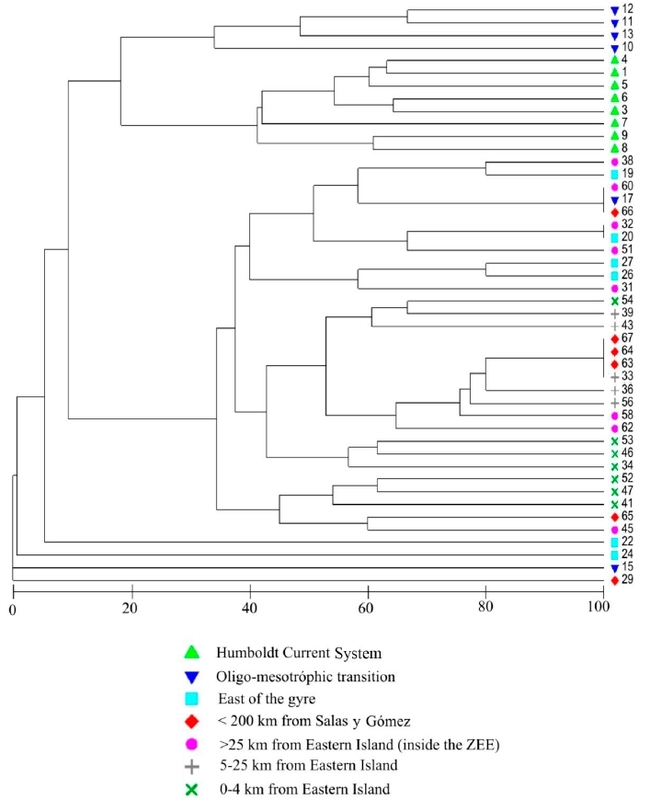 The oceanic genera Rhizosolenia and Hemiaulus, which typically contain N2-fixing endo-symbionts (Fiore et al., 2010), was much more represented in samples taken within 25 km of Easter Island (Fig. S1), with seven species in total recorded, in comparison with only two species recorded in the CIMAR-5 samples from coastal stations, four species from outer Humboldt Current waters, and four species from the other stations in the gyre but away from the islands. This would be consistent with a possible increase in N2-fixation and productivity near the island, perhaps due to natural Fe-fertilization. CIMAR-5 data on dissolved silica is sparse, with this parameter apparently not measured in most samples. Silica has usually been observed to be higher than nitrate, shows little fluctuation in surface gyre waters, and has been suggested not to be a limiting nutrient (discussed above), so silica would not be expected to explain these changes. Also, the lowest silica concentrations reported (<0.8 μmol L-1) are near Easter Island (Moraga et al., 1999), possibly indicating consumption by diatoms. Dinoflagellates showed no similar patterns in composition (Fig. 7, S3), although the much slower growth rate of dinoflagellates might not allow their communities to respond rapidly in the case of highly localized natural fertilization. Figure 7. a) Similarity dendrogram (Bray-Curtis) for species richness of diatoms in CIMAR-5 data. Stations have been grouped according to oceanographic province: HC: Humboldt Current System, containing all eigth stations east of 76°W. O-M: Oligotrophic-Mesotrophic transition, containing six stations between 77°-88°W. EG: Eastern Gyre, containing six stations from 91°-103°W. The eastern boundary of the SPSG was approximated based on isolines of 0.1 μg L-1 chlorophyll-α and 1 L-1 nitrate (Raimbault et al., 2008). <200 SG: stations within the western EEZ (defined as less than 200 km from Salas y Gómez Island). >25 EI: stations within the eastern (Easter Island) portion of the EEZ, but well offshore (>25 km). 5-25 EI: stations from within 25 km of Easter Island but further from 4 km from shore, where an island mass effect is expected to be most visible (the 25 km threshold was selected based on the geostrophic velocities reported in Andrade et al. (2014). 0-4 EI: stations less than 4 km from Easter Island, the communities with possible neritic influence. The 4 km threshold was selected arbitrarily to help distinguish possible neritic species from oceanic species affected by potential island mass effects. As Andrade et al. 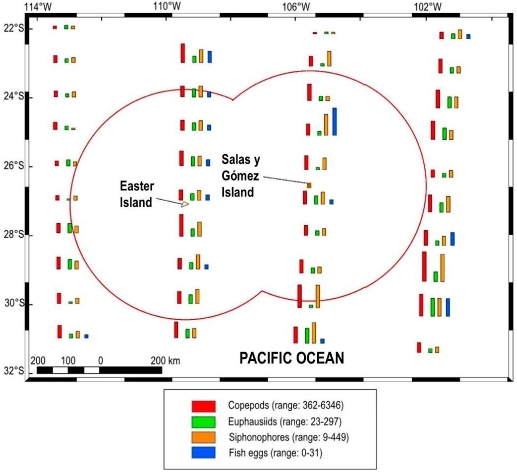 (2014) did not detect an island mass effect around Salas y Gómez Island, we did not divide stations in the same way based on distance from that island, b) aggregated and average diatom species richness across the grouped stations. Fig. S1 and S2 show the same data as individual stations, but without grouping. c-d), same as a-b) but for dinoflagellate species data. The IFOP-1979b cruise data suggested a general increase in zooplankton bio-volume towards the north and east (Fig. 8), which may be associated with the submarine Nazca/Salas y Gómez ridge and the direction of weak geostrophic currents (Andrade et al., 2014). Nevertheless, no pattern was evident in numerical abundance of important zooplankton groups (copepods, euphausiids, siphonophores) (Fig. 9). CIMAR-5 data indicated a trend of higher zooplankton bio-volume near Easter Island (Fig. 10), but it is not clear how much this might be a result of the increased occurrence of meroplanktonic larvae (from benthic adults in island and seamount habitats). An increase in euphausiid abundance was recorded near the north side of Easter Island (Fig. 11), reaching a maximum of 167 ind m-3, much higher than the range of 3-14 ind m-3 seen in the east of the gyre in the CIMAR-5 dataset (not shown). It would require higher sampling efforts (deeper tows, as mentioned above) to confidently detect such differences due to the high variability among samples in all zones. It is also not clear how coupled zooplankton and phytoplankton productivity would be at the relatively small scales associated with Easter Island. Figure 8. Zooplankton biomass from 0-300 m vertical tows in the IFOP-1979b cruise. The EEZ defined by Easter Island and Salas y Gómez Island is defined by the red line. Figure 9. Abundance of distinct zooplankton components and fish eggs sampled by integrated vertical net tows during IFOP-1979b. The EEZ defined by Easter Island and Salas y Gómez Island is defined by the red line. Figure 10. Zooplankton biomass sampled in stations within the EEZ during CIMAR-5. Figure 11. 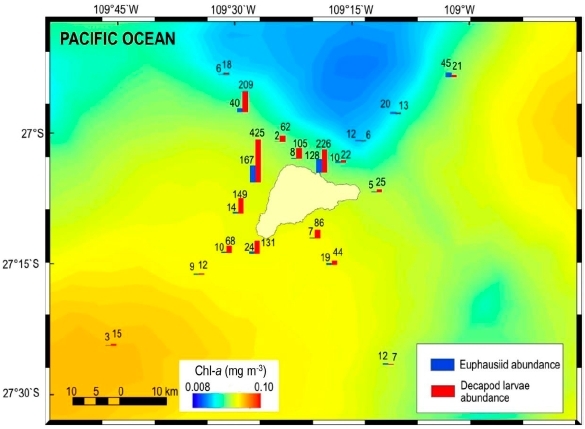 Numeric abundance of euphausiids and decapod larvae in CIMAR-5 stations near Easter Island. Numbers above bars represent exact abundance. The data are plotted on SeaWIFS surface chlorophyll data from October 1999, as before, although the color scale is different. 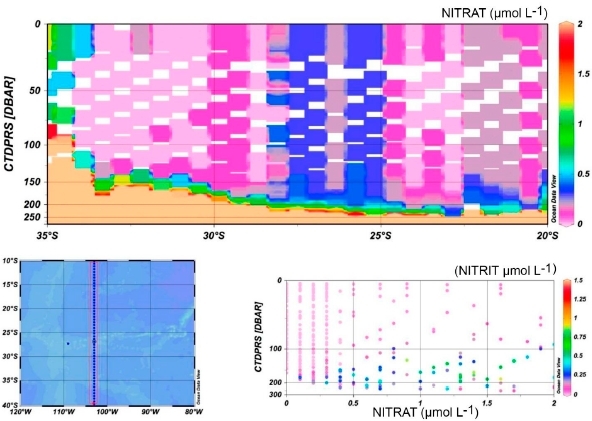 The CIMAR-5 dataset showed much higher surface nitrate levels near Easter Island in comparison to most other datasets from the SPSG, with nitrate+nitrite reaching nearly 1 μmol L-1 (Rojas et al., 2004). In general, levels were >10x higher than those reported for the stations nearest to Easter Island in the BIOSOPE and BIGRAPA cruises (Raimbault et al., 2008; Farías et al., 2013). Only one CIMAR-5 station showed relatively low levels (0.05 μmol L-1, which is still much higher than typically reported for SPSG surface waters by other investigators). This was CIMAR-5 station 34, near the southeast end of the island and, notably, where long-term satellite data indicates a center of increased surface chlorophyll-α is found. If correct, these data would suggest that Easter Island generates an important increase in plankton productivity either through nutrient injection or stimulation of the microbial conversion of the high DON in SPSG waters into DIN. 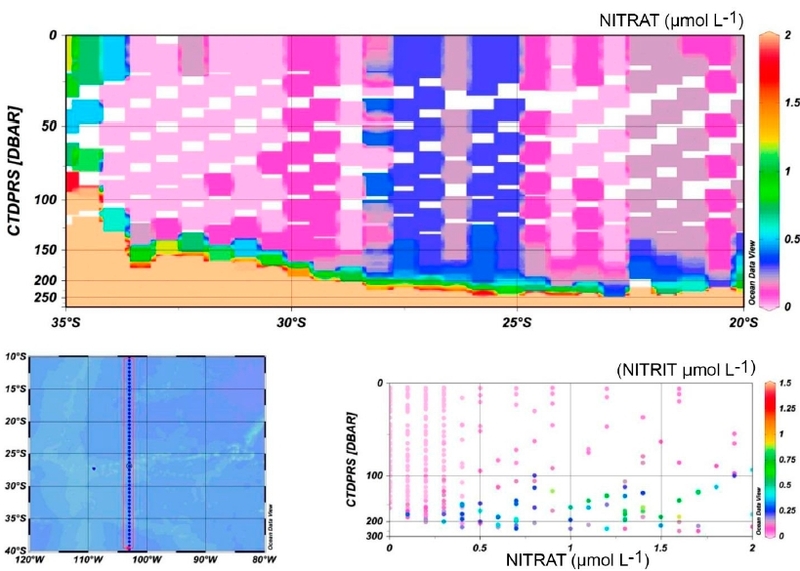 Also, the WOCE P18 cruise along the same transect in 2008 did report two spikes in nitrate in the upper 50 m, reaching 0.3 μmol L-1, between 27.5°S and 25.2°S, near the Nazca/Salas y Gómez ridge (nitrate was ≤0.1 μmol L-1 or undetectable elsewhere between 23°S-32°S on that cruise) (Fig. S4), although temperature and salinity profiles did not show corresponding signals of upwelled water (not shown). Nevertheless, nutrient measurements in oligotrophic systems require especially precise and exact protocols to reach high sensitivity, lowest detection limits possible, and eliminate background noise in the data, so it is not yet clear how well patterns can interpreted from the CIMAR-5 data as none was presented from nearby regions where Raimbault et al. (2008) and Farías et al. (2013) found much lower nitrate levels. The review and re-analyses of data presented here support the suggestion that an island-mass effect may exist around Easter Island. Possible changes in potential nutrients around the island are suggestive but not yet conclusive. Nevertheless, it is possible to highlight both challenges and possibilities in resolving this question in future studies. Collection of adequate zooplankton data may require very intensive sampling with equipment capable of generating deep depth-resolved samplings. Adequate depth-profiles of in situ chlorophyll (e.g., by fluorescence), measures of phytoplankton communities and primary production, and, above all, high quality nutrient analyses, would be highly effective in answering this question. Global warming is expected to increase ocean stratification, extending oligotrophic areas (Doney et al., 2012). Indeed, satellite observations indicate that oligotrophic sub-tropical gyre areas are expanding at an average rate of 1.9% per year (15% between 1998 and 2006) (Polovina et al., 2008). In that work, the rate of expansion of the SPSG was the lowest of the sub-tropical gyres by percentage, but was the second highest in absolute area. Other work suggests that global ocean primary productivity and sea surface chlorophyll may be declining (Behrenfeld et al., 2006). How the pelagic ecosystem of the central eastern SPSG, particularly near Easter Island and Salas y Gómez Island, will respond if the gyre increases in size depends in large part on how much the system depends on external inputs. For example, if it is a net heterotrophic system dependent on the slow input of organic material (e.g., eddy transport from more productive waters to the east, see Andrade et al., 2014), an expansion of the gyre could increase the distance from those sources, decreasing input. If the system is net autotrophic despite very low productivity, as it appears to be, then the threat from global change comes in two principal forms. First, further increasing the stratification of this ultra-oligotrophic zone could further diminish the already exceptionally low inputs of nutrients from deeper waters. Second, while the gyre may expand, modeling and empirical studies suggest a strengthening of upwelling-favorable winds along the eastern border of the South Pacific, which may lead SST to drop at the coast (Bakun, 1990; Bakun et al., 2010; Echevin et al., 2011) , which may possibly already be enhancing coastal productivity (Gutiérrez et al., 2011). Thus, while the ocean on average is expected to warm, the Humboldt Current System could experience cooling for several decades. A consequence of these two counter-posed trends may be an intensification in the productivity gradients from eastern boundary currents to the oligotrophic gyre centers. Additionally, increasing eastern coastal productivity may intensify sub-surface minimum oxygen zone (OMZ) (Stramma et al., 2008), where O2 is depleted (reaching anoxia) due to decomposition of material sinking from the surface, an effect that will exacerbate the generally reduced O2 content of a warming ocean (Doney et al., 2012) . This is predicted to increase loss of fixed N from ocean inventories in OMZs (Codispoti, 2007), potentially enhancing gyre oligotrophy. The intense Eastern Tropical South Pacific (ETSP) OMZ in front of northern Chile and Peru has its maximum extension (3000 km) at =10"S, reaching 120°W (Fuenzalida et al., 2009). The most important loss of fixed nitrogen from the ocean due to denitrification occurs in OMZs (Codispoti, 2007), and the westward migration of nitrate-deficient surface waters further intensifies the oligotrophy of the SPSG. Increasing the ETSP OMZ would further enhance the deficit in fixed N in waters of the central and eastern SPSG, making the ultra-oligotrophy even more extreme. Potential human-induced local increases in nutrient input might be rapidly diluted in this vast system, affecting only very near-shore, shore reef and intertidal ecosystems, but regional and global increases in inputs of Fe and other metals that are crucial micro-nutrients might affect the larger pelagic system. Atmospheric deposition of iron to oceans has increased since the pre-industrial era, and might increase in SPSG in the future from global sources (Mahowald et al., 2009). As in all oceans, plankton communities of SPSG are also threatened by ocean acidification (Doney et al., 2012), which may specifically affect gyre plankton communities since gyre species may have less pre-adaptation to fluctuations in ocean pH compared to coastal species (Beaufort et al., 2011; Kelly & Hofmann, 2013). Also, synergistic effects of acidification on Fe and N-cycling (Law et al., 2012; Shi et al., 2012) may be more important in ultra-oligotrophic than productive environments, and may differentially affect organisms (Law et al., 2012), potentially leading to community shifts with functional consequences. As the extremely oligotrophic SPSG already appears to be distinct in terms of Fe and N cycling, central and eastern SPSG plankton might be differently affected by ocean acidification then plankton communities in other gyres. It is not clear how benthic communities near Easter Island and surrounding seamounts depend on local pelagic productivity, making it crucial to understand the nature of the possible island-mass effect around Easter Island for conservation planning. If an island-mass effect is important to subsidizing such communities by increasing local integrated primary productivity, the system may locally be more resistant to the larger-scale effects of global climate change. If an island-mass effect only involves changing the depth-distribution of plankton, which could also increase the availability of this food source for shallow benthic near-shore communities, a larger-scale decrease in already very low plankton productivity might be a severe stress. Another threat is the accumulation of plastic debris. Recent studies found that the SPSG is accumulating plastic debris and residues such as those previously found in the North Pacific and Atlantic gyres (Law et al., 2010; Maximenko et al., 2012; Eriksen et al., 2013). Easter Island is at the western border and Salas y Gómez Island is near the center of the predicted and observed "garbage patch". Plastic debris threaten marine animals both mechanically, by entanglement and interfering with digestion (Gregory, 2009), and chemically, by the release of long-lived bio-active organic compounds (Andrady, 2011; Hirai et al., 2011). Plastic marine debris may also represent an environmental threat as a vector for the transport of toxic, noxious, and/or invasive species (Masó et al., 2003; Gregory, 2009; Zettler et al., 2013). Microbial-mediated biodegradation is suspected to be important for the natural bioremediation of this type of pollution (Andrady, 2011; Zettler et al., 2013). However, the natural accumulation of high DOC levels in the SPSG suggests that the capacity for biological decomposition of organic material is already exceptionally low in the SPSG (Raimbault et al., 2008), which might mean both plastic debris and the organic compounds they release will have a longer-term persistence in this environment. Larger-scale patterns of plankton ecology and biogeochemistry in the SPSG have begun to be revealed by the cruises occurring within the last decade, but major gaps remain even in basic descriptive knowledge, as detailed above. Easter Island and Salas y Gómez Island are not only unique in their special cultural heritage and island ecosystems, but they are also located near the center of the largest ocean habitat, and one of the most extreme ocean surface environments, on the Earth. Thus there is great value in addressing our gaps in knowledge, especially within the EEZ these islands define, both in terms of local marine conservation needs and in understanding and monitoring global ocean functioning in a rapidly changing world. In terms of large-scale processes, it is crucial to understand the connections between continental waters and the central SPSG, especially as this gradient may be in the process of intensifying with global changes. Oceanographic expeditions integrating more descriptive physical, chemical, and ecological analyses with biogeochemical process studies across this productivity gradient will be especially valuable. Special attention must be given to understanding sources, sinks, and loss terms. Grazing terms have not been addressed in this zone, and will be particularly challenging. Microzoo-plankton data are very scarce, with the exception of the tintinnid ciliate data from the BIOSOPE cruise, and these organisms may consume the major portion of primary production in oligotrophic waters. Measuring these grazing terms is quite challenging, especially as there are still important methodological debates (Dolan & McKeon, 2005). Finally, many zooplankton, such as copepods, can enter periods of pelagic dormancy, while large portions of microbial cells in a water sample are often found to be physiologically inactive. Studies of the physiological state of different plankton might be highly valuable for understanding ecosystem function and carbon flow in the region. The type of island-mass effect that may exist at Easter Island, and what benthic-pelagic coupling occurs, are issues of special importance to marine conservation. Higher resolution horizontal and vertical sampling coupled with hydrographic observations is needed. Additionally, in this zone it is especially important to sample also mesopelagic and possibly bathy-pelagic zones and take into account neighboring seamounts. For animal zooplankton, effective sampling studies will require the implementation of technology that can provide depth-resolved data throughout the midwater and below, such as a Multiple Opening and Closing Net Environmental Sensing System (MOCNESS) or towed plankton video recorders. Presently, the only data on the seasonal variability of the central and eastern SPSG comes from satellites. Direct data will be essential for understanding this region. The long time-series data from the North Pacific and North Atlantic gyres coming from the Hawaiian Ocean Time Series (HOT) and the Bermuda Atlantic Time Series (BATS), have proven exceptionally valuable in understanding ocean function (Ducklow et al., 2009). Easter Island offers a potential platform for implementing similar long-term marine ecological and oceanographic studies in the South Pacific Gyre, which will be essential for marine conservation efforts locally and for increasing our understanding of the entire South Pacific, the largest ocean basin in the world. Ideally, buoys providing continuous measurements would be coupled with short sampling cruises throughout the year (e.g., monthly) to measure basic physical, chemical, and biological parameters of the ocean. This work was financed by the Pew Environmental Group. We give special thanks to three reviewers who provided valuable suggestions to improve the manuscript, and also to M. Fernandez, J.C. Castilla, and S. Hormazábal for the opportunity to participate in this study. Marchant, M., J. Zapata, V. Ruíz & H. Moyano. 2004. Foraminíferos bentónicos recientes de Islas Oceánicas: Isla de Pascua e Isla Salas y Gómez, Chile. In: R. Rojas, Y. Guerrero, J. González & N. Silva. 2004. CDROM Reporte de Datos del Crucero Oceanográfico Cimar 5 Islas Oceánicas. Centro Nacional de Datos Oceanográficos. Servicio Hidrográfico y Oceanográfico de la Armada. Valparaíso, [http://www.shoa.cl/n_cendhoc/productos/cimar-5/index.htm] [ Links ]. Mujica, A. & E. Espinoza. 2004. Distribución y abundancia de larvas de crustáceos decápodos y crustáceos holoplanctónicos. In: R. Rojas, Y. Guerrero, J. González & N. Silva. 2004. CD-ROM Reporte de Datos del Crucero Oceanográfico Cimar 5 Islas Oceánicas. Centro Nacional de Datos Oceanográficos. Servicio Hidrográfico y Oceanográfico de la Armada. Valparaíso, Chile. [http://www.shoa.cl/n_cendhoc/productos/cimar-5/index.htm] [ Links ]. Rojas, R., Y. Guerrero, J. González & N. Silva. 2004. CDROM Reporte de Datos del Crucero Oceanográfico Cimar 5 Islas Oceánicas. Centro Nacional de Datos Oceanográficos. Servicio Hidrográfico y Oceanográfico de la Armada. Valparaíso, Chile. [http://www.shoa.cl/n_cendhoc/ productos/cimar-5/index.htm] [ Links ]. Sielfeld, W., G. Guzmán, T. Cortez, E. Quiroga, A. Valdéz, M. Labrin, C. Mancilla, A. Kawaguchi & M. Cordero. 2004. Fauna mesopelágica del Proyecto Cimar 5 Islas Oceánicas. In: R. Rojas, Y. Guerrero, J. González & N. Silva. 2004. CD-ROM Reporte de Datos del Crucero Oceanográfico Cimar 5 Islas Oceánicas. Centro Nacional de Datos Oceanográficos. Servicio Hidrográfico y Oceanográfico de la Armada. Valparaíso, Chile. [http://www.shoa.cl/n_cendhoc/productos/cimar-5/index.htm] [ Links ]. Appendix 1. List of taxa encountered in the Easter Island/Salas y Gòmez Island EEZ or in nearby eastern gyre waters. Figure S1. a) Diatom species richness, b) richness of diatom species in the genera Rhizosolenia and Hemiaulus, some of which may contain N2-fixing endosymbionts, c) dinoflagellate species richness. Figure S2. 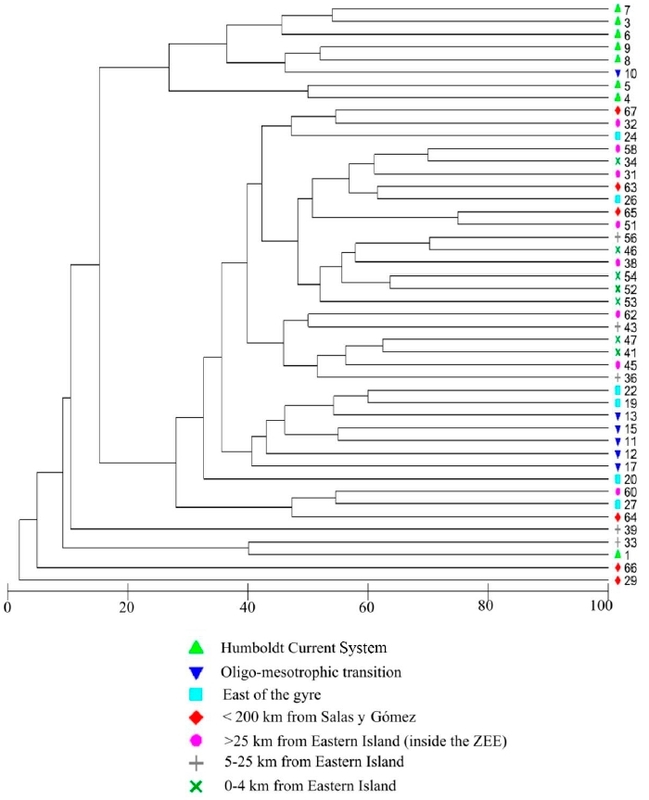 Similarity dendrogram (Bray-Curtis) of diatom species occurrence sampled at all stations of CIMAR-5. Figure S3. 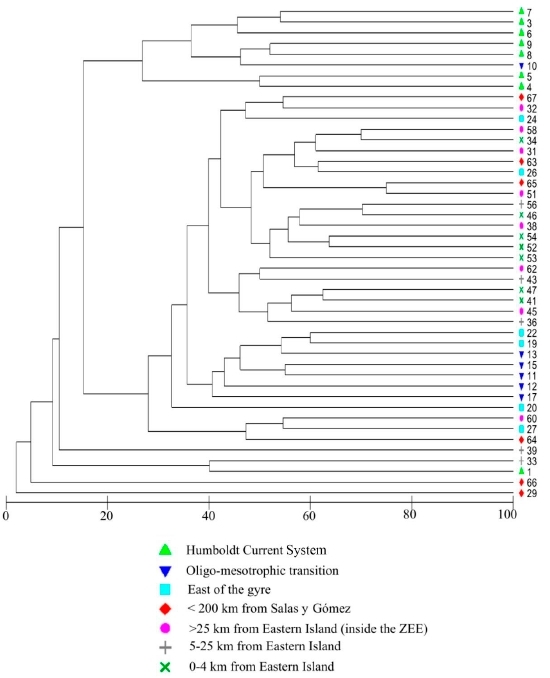 Similarity dendrogram (Bray-Curtis) of dinoflagellate species occurrence sampled at all stations of CIMAR-5. Figure S4. Nitrate and nitrite data from the WOCE P18 line sampled in 2007. Deeper samples are off scale. Note the increase in nitrate to 0.3 μmol L-1 at the surface near the crossing of the Salas y Gómez/Nazca ridge.